Jonathan Walker Valvano – one messy office, three favorite classes, eight textbooks, the best job on the planet spanning four decades, thousands of mistakes but a few successes, thousands of brilliant students, one hundred and fifty thousand on-line students, and millions of YouTube views; lifelong explorer with one mind, one body, one soul,one lovely horse with beautiful spots, three free-spirited cats, countless friends, three wonderful children; always striving to make the world a better place. 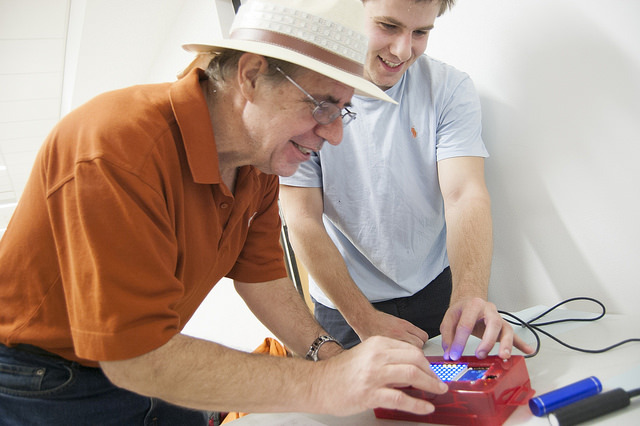 His soldering iron is currently plugged in at his new office at EER 5.820 here at The University of Texas at Austin. Exciting News: I got a wifi client system working with the low-cost ESP8266 wifi module for both TM4C123 and MSP432 microcontrollers. The project connects to an access point and fetches weather data from openweathermap.org. View the ESP8266.c file. Download project. Instructions to create your own data logging server using Google App Engine. Volume 1, Introduction to the MSP432 Microcontroller (2nd edition, 2nd printing- January 2019) and Volume 2, Real-Time Interfacing to the MSP432 Microcontroller (2nd edition, 2nd printing- January 2019), 2019, ISBN: 978-1512185676, and 978-1514676585 Volume 1 from Amazon Volume 2 from Amazon, Volume 1 includes architecture, assembly language and C programming for the Texas Instruments MSP432. Volume2 includes interfacing, circuits, real-time systems and the internet of Things (IoT). Either of these books could be used to accompany Texas Instruments Robot Systems Learning Kit. Embedded System Courses I teach at the University of Texas Keil uVision installation and configuration Data sheets How to install EE319K/EE445L/EE345M software on a Macintosh Installing LaunchPad drivers: 1) Download and unzip windows drivers for the TM4C123 from ti.com http://www.ti.com/tool/stellaris_icdi_drivers, alternative download 2) Plug TM4C123 LaunchPad board into PC (debug port) and turn on power; 3) Open device manager in Windows, and for each TI driver (twice), a) right click the missing driver (yellow triangle), b) update driver, browse to spot where you just downloaded and install, Windows 7 details. Windows 8 and 10 are similar to Windows 7. Windows 8 and 10 no longer need driver signature turned off. Undergraduate class: EE319K students discover how the computer interacts with its environment. Students have hands-on experiences of how an embedded system could be used to solve EE problems. The analog to digital converter (ADC) and digital to analog converter (DAC) are the chosen mechanism to bridge the CE and EE worlds. EE concepts include Ohms Law, LED voltage/current, resistance measurement, and stepper motor control. CE concepts include I/O device drivers, debugging, stacks, FIFO queues, local variables and interrupts. The hardware construction is performed on a breadboard and debugged using a multimeter. Software is developed in assembly and in C for a ARM Cortex-M TM4C123 microcontroller. Prerequisites: EE306 or BME303 with a grade of at least C-. EE445L Embedded Systems Design Lab Syllabus Fall 2018 Old Exams I am teaching EE445L this Fall 2018, and again Fall 2019. Professor McDermott will teach EE445L in Spring 2019. Graduate lab class: Instrumentation and real time software. Prerequisites: Microcomputer interfacing, C, op amps, differential equations. Measurements of pressure, volume, thermal properties, and perfusion. Also there is electrical and thermal modelling. TExaS Robots version 1. 83b, a simulated battlefield for 50 9S12DP512-controlled robots (download the Trobots.zip file). This 68HCxx WebRing site owned by Jonathan W. Valvano. Last updated December 27, 2018 Send comments to: Jonathan W. Valvano .